I think it’s fair to say George Orwell’s Nineteen Eighty-four is one of the most enduring novels of the 20th century. Playing off real and perceived fears regarding communist states, there remain a small number of governments exemplifying the tyranny of Big Brother even in the 21st century. But brainwashing and oppression are not always a grand political scheme orchestrated from the very top. It likewise exists in other aspects of life, from race to culture, shopping to beauty. Feeling the time ripe to discover the breadth of ideas the term Orwellian has come to span, George Sandison, editor at Unsung Stories, decided to commission a bevy of writers to produce short stories offering a contemporary perspective on the quiet ways brainwashing, "brainwashing", and oppression might be used, or are currently being used, among us. 2084: The Anthology the result, it is a surprisingly varied anthology of original material that stands out as one of the year’s best. 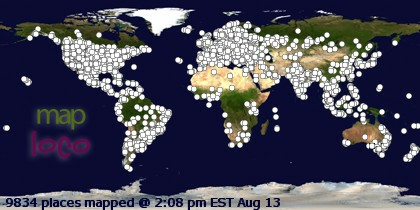 Gaining momentum with time, the anthology opens a touch slow. “Babylon” by Dave Hutchinson attempts to present a future European Union as tyrannical for its immigration policies. Packing too many large ideas into a small story, it tells of a Somalian refugee being smuggled across the Mediterranean and the racial surprise he has planned upon arrival on European soil. Seeming to run with far-left opinion (ironically the type of faith in media Orwell sought to expose), it does not recognize the effort the EU (not without resistance, natch) has made bringing in refugees and immigrants. Worse yet, Hutchinson doesn’t play fair when stacking the deck entirely in his favor: the Somali man is without creed or religion, and possesses a cosmopolitan knowledge of language, culture, and James Bond-style counter intelligence, i.e. not very representative of the average Somalian immigrant, just as a European Union bent on preventing all non-white immigrants from entering the continent is likewise not wholly representative… In something loosely resembling a morlocks/eloi situation, “Here Comes the Flood” by Desirina Boskovich is a bleak future wherein the current capitalist glut has consumed most of the world’s resources, forcing the affluent to live underground. The people living on the surface under the burning sun fight to join them while the people underground fight to keep them out. Told from a domestic perspective, this dichotomy comes across as very human. Perhaps the most recognizably Orwellian story in the anthology, “Fly Away, Peter” by Ian Hocking is a disturbing vignette of a children's home run by an older woman. Calloused by the State (a tyrannical power that has taken everything from her), she seems to lack even a soul—a powerful story. Addressing front page news while key decisions are made on page three, “A Good Citizen” by Anne Charnock looks at a day in the life of an average woman who feels involved in the democratic process. Citizens able to vote on weekly referendums for seemingly key social matters, the reality is in fact deceivingly troubling - a compliment to the story. The most visually stunning piece in the anthology, “Glitterati” by Oliver Langmead tells of Simone, and the fateful decision he makes one morning what clothes to wear to work. Simone among the city's most fashionable, trends dictate that Tuesdays must be white. Imagine to his surprise when he arrives that day and everyone wears purple—it’s Wednesday. But when Simone's boss—the ultimate in fashion—arrives, things truly take a turn for the unexpected. Great use of color and image, and certainly one of the most unique stories in the anthology. Though technically it is science fiction (what remains of life on a space station orbiting Earth), “Room 149” by Jeff Noon still feels more like Casablanca, or some such other melancholy romance. About an inspector in an abandoned orbital, he finds a dusty love letter that sends his mind to holographic noireville. Robocalypse, that is all I have to say about Courttia Newland’s “Percepi”. The most brilliant, sophisticated story in the anthology, “Degrees of Ellision” by Cassandra Khaw is, in its broadest sense, about how malleable contemporary media (in all its manifestations) really is. What to think when recorded media is just as subjective as memory? Written in atypical format that accomplishes its goals structurally as much as through plot or exposition, it makes for superb reading. A bizarre little story, “Saudade Minus One (S-1=)” by Irenosen Okojie tells of a female rancher receiving her first child soldier and what he does to her "farm". Social media bound to make its way into a 21st century anthology about dystopias, with Malcom Devlin’s “March, April, May” it does. About a group of friends who interact with a dead friend's account on Facebook (called The Space in the story), Devlin peels back a layer of truth regarding social media’s machinations (aka algorithms) and the human response to it, making for a contemporary, engaging, if not jaded story. About a poor man willing to do about anything to have a job to feed his family, “The Infinite Eye” by JP Smythe tells of the man’s acceptance of a near-future street offer. Arriving at an abandoned factory outside the city limits, he is attached to a network and given the ability to switch his view between steeet cameras and drones to help police apprehend criminals. Criminal is, of course, a relative term, but so too is perception. Lavie Tidhar is hit or miss with me, and with “2084 Satoshi AD” we have a hit. Nicely stylized, it tells of an assassin robot sent to kill the creator of bitcoin. Style giving the story a layer of much needed cleverness, the result is something better than the weak premise, and makes for good reading. Last and longest piece in the collection is Christopher Priest’s “Shooting an Episode". About the moderator of a reality tv show, Priest borrows a page from Robert Sheckley’s “The Prize of Peril” to discuss the gray area between reality tv and reality. Densely written, the story’s setting wonderfully presents the grayness, and how little, in fact, it takes humans to act—in both senses of the word—on what they perceive or want to be reality. This type of story Priest’s specialty, the reader finishes the anthology in awe of the vision yet troubled by the potential for ‘reality’. 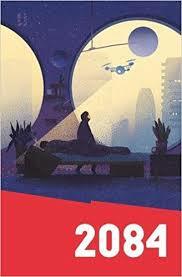 In the end, 2084 is a very solid anthology that rarely is openly analogous to the Orwell novel which inspired it. Not an endless parade of stories featuring doublespeaking big brothers monitoring people with initials W.S., Sandison brings together a much wider variety, each of which is a dystopia (some more, some less) but from a perspective other than pure tyranny or propaganda. Whether it be social media or television, fashion or social class, employment or children’s rights, no two stories tread the same ground—which is certainly not something that can be said of all themed anthologies. The stand-outs for me are the Khaw, Priest, Langmead, Hocking, and Charnock stories, while for other readers it will be others given the quality of choice. Accordingly, the anthology as a whole should be considered as one of the best of 2017.